You'll be £12.99 closer to your next £10.00 credit when you purchase Frome in the Great War. What's this? The Somerset town of Frome is something of a paradox. Since being founded at the end of the sixth century its fiercely independent nature has been unchanging. A nature which, as one columnist has noted: 'seems to have revolved around the eminently sensible attitude of “To hell with national events! We will stay as we are.”' And yet a century ago, when called on by its country to do its duty in the Great War, it rose to the task admirably. Men from Frome and the surrounding area experienced action in all the theatres of war that the global conflict encompassed, and they took part in the numerous battles and campaigns, on land and at sea, that have become synonymous with that conflict: Ypres, Gallipoli, Jutland, the Somme. At the same time, its civilian population received a special commendation after the war for its effort throughout it. However, the town’s contribution did not stop there, as many of the returning soldiers helped to create several of the national and international monuments and memorials that would pay eternal tribute to their comrades who fell on the fields of Flanders and elsewhere. Using letters, diaries, photographs, newspaper reports and eyewitness accounts, along with other archive material, local historian and author David Lassman has assembled the story of Frome during the Great War; a story which charts the transformation of this once rich and powerful textile centre and manufacturing town, along with its people, through the life-changing events of 1914 to 1918. If you are tiring of general WW1 books and have a research interest in this Somerset market town, this one is for you. 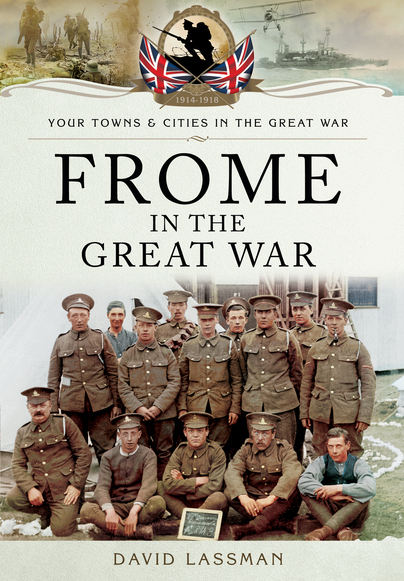 This volume tells the story of Frome in Somerset, not just of those men and women who served in all the theatres of war, but also of the efforts of the town itself - which earned a special commendation after the war for the part it played. Many of those who returned to the town helped create the national and international monuments and memorials that paid tribute to the fallen on the battlefields. Using letters, diaries, archives and newspapers, the author tells the town's story.